Six-point spreader bar with 360° rotation tilts for extra comfort and safety. 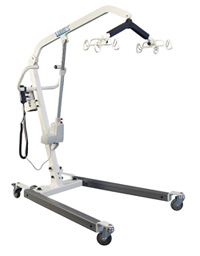 Uses Lumex six-point, four-point slings or 2-point slings. Unique, ergonomic foot pedal leg opening. Large, easy to grip handles for easy maneuvering. Lower base height maximizes stability and fits under most beds. Rubber base coating protects furniture and walls. 24V DC motor allows quiet smooth operation. Ergonomically designed hand pendant with pendant hook. Warning beep for low battery charge and weight capacity levels. Easy access emergency stop button. Available with maximum weight capacity of 600 lb. Accessory storage bag included for slings and charger. Designed to meet the requirements of HCPCS code:E0635. Lifting Range Min Height 27.0"